Ongoing violence and Islamist extremism in Tunisia and Egypt show that the rise to power of moderate Islam has failed to absorb its radical elements and integrate them into neo-liberal politics. In Tunisia, recent clashes between police and members of Ansar al-Shariah, a banned radical Islamist group, point to a widening rift with the moderate ruling Ennahda party. Under former President Zine al-Abidine Ben Ali, radical and moderate Islamists alike faced brutal repression. Many of them, including Ennahda leader Rachid al-Ghannouchi, were forced into exile. Following Ben Ali’s ouster in 2011, Ennahda gained power using a mix of religious populism, political pragmatism and co-optation. The leniency that characterized its approach to extremist groups had to end after a series of events, including an attack on the U.S. embassy in Sept. 2012, and the assassination of secular opposition leader Chokri Belaid in Feb. 2013. Extremists have become frustrated that Ennahda has not brought them the kind of Islamist state they had hoped for. The “scientific” wing of the Salafist movement - better understood as the “scripturalists,” who initially displayed a cautious interest in politics - have hunkered down. Jihadi Salafists, however, have resumed their advocacy for armed struggle against forces and individuals seen as impious, including President Moncef Marzouki. This month, Seifullah Ben Hassine (alias Abu Iyad al-Tunisi), who is head of Ansar al-Sharia, called for war against Ennahda. “To those tyrants hiding under the cover of Islam, you should know that you are making blunders which will bring the battle closer,” Tunisi warned in a statement posted online, which revealed a radical change from his previous stance vis-à-vis Islamists in power. Ennahda had sought to co-opt radical Salafists and use them as political assets during elections, but it has recently lost control over them, said Tunisian sociologist Mohamed Jouili. “The Salafist movement... began to feel that it is stronger than before, and that it no longer needs the political cover of Ennahda,” said Jouili. “Now the conflict is clear, especially since the Salafist movement in general has expressed that it is against the state, and that it supports divine law. This has put Ennahda in an uncomfortable position,” he said. Ennahda is facing both a political and security dilemma when it comes to dealing with its more radical brethren, Jouili added. On the one hand, it does not want to escalate tensions within the Islamist camp. On the other hand, it has to meet its national and international obligation and bring violent extremists under control. Prime Minister Ali Laraydeh’s response to clashes between Ansar al-Sharia and the police last week highlighted this situation in which the government finds itself. While Laraydeh vowed to deal with the organization “with total seriousness,” he fell short of describing it as a terrorist group, despite its clear ties to al-Qaeda. “This organization exists but isn’t legal. It must either follow the law or end its existence,” the prime minister said. It is possible that Tunisia’s Salafists will eventually embrace politics, as most Salafists in Egypt have done, Jouili said. However, that would likely only concern moderate Salafists. Jihadists are expected to remain faithful to their violent ideology. In Egypt, they have not changed, even with the Muslim Brotherhood in power. 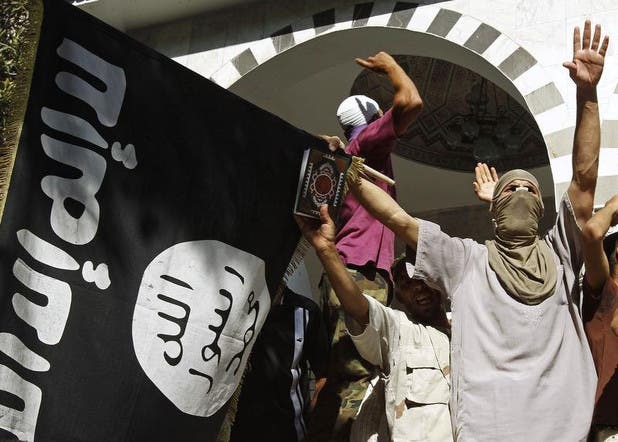 Nageh Ibrahim, a member of the al-Gama’a al-Islamiyaa, considered by the United States a terrorist group, expects that a violent intra-Islamist confrontation will take place between the Brotherhood and ultra-radical elements of jihadi Salafists and al-Qaeda-linked takfiri groups. The “good” relationship between the Brotherhood and Israel will prompt jihadists and takfiris to carry out further armed operations in the Sinai, leading to a violent clash with the Brotherhood, said Ibrahim. Before it gained power, the Brotherhood thought it could bring these groups under its control and use them to defeat its rival secular forces, he added. The Brotherhood “did not anticipate that these extremists would turn against them and carry weapons,” Ibrahim said. Both the Brotherhood in Egypt and Ennahda in Tunisia have failed to domesticate jihadists, but they are far less dangerous in Egypt than they are in Tunisia, said Waheed Abdel Mageed of the al-Ahram Center for Political and Strategic Studies. “Unlike in Tunisia, jihadists in Egypt are less vocal among Salafists, and although they number in the thousands, they are far less influential than the scripturalist Salafists, who number in the hundreds of thousands,” he said. Most Salafists in Egypt are “non-confrontational,” and embrace politics as a way to spread their school of thought, which advocates following Islamic texts and living the lifestyle of the first Muslims, Abdel Mageed added.